What to Expect from an Escape Room? An escape room is one well thought out puzzle room. The goal is for the group to work as a team to solve all the puzzles and escape from the room. I’ve heard of the room several years ago, but never had the opportunity to try one until recently. I had no idea what to expect from the Escape Room, but admit it was very challenging. We ended up signing up with an Escape Room called Houdini Escape in SF. It is considered one of the more challenging Escape Rooms, but also has the most automated tricks. A representative is with us along the way. Depending on how we progress, they provide tips with the puzzles or get us back on the right track. It’s ideal to go with a group of friends (or coworkers) who know each other. Requires teamwork from all members to collaborate on puzzles. Feel the stress, as you’ll have a limited amount of time to escape. Don’t expect to solve all the puzzles together. You will want to break up into smaller teams, with leaders to delegate different tasks. Then communicate effectively to bring pieces together to solve larger problems. Be prepared to think outside the box, be meticulous, focused, and detail oriented when searching. Lock up your cell phones and cameras before beginning. The The Great Houdini Escape room in San Francisco in the Palace of Fine Arts was a great first experience. We had a group of 10, we all (kind of) knew each other via a mutual couple. The cost of attendance is by room, not by the number of people in the group ($400) and you must book reservations by group, not individually. I believe you have 80 minutes to solve the problem, so being attentive to the time is imperative to success. I don’t want to spoil any of the puzzles, so I won’t go into much detail on each individual puzzle. What I will say is I admit most of the puzzles were ingenious (remember, this is my first escape room, so I’ve never been exposed to this level of puzzle). Much more advanced that I was originally expecting and I was surprised by both the escape room solutions, but also the outcome of the solution. After escaping (with a lot of help from our representative), we had enough time to go to dinner. I had a huge headache, mostly due to the amount of outside the box thinking on a weekend, but also from the lack of ventilation in the room. It made us feel better that the only 18% of teams escape, but also scary to know that the fastest time was just under one hour (I assume without any tips from the representative). At the end of the day, it reminded me a lot of those click to escape Android apps, but instead of working puzzles in the digital world, this one includes real life puzzles, which is a whole new dynamic. 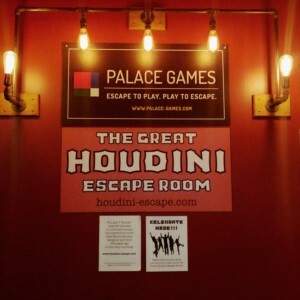 I highly recommend the Houdini Escape room in San Francisco for those who are advanced. I do believe the room was too advanced for our group of novices. But when compared to other team building exercises that I’ve done at work, this one requires a lot of thinking and working together. Compared to cooking classes, picnics, fishing, baseball games, I’d rate Escape Rooms being one of the more favorable options. I’m going to recommend doing an escape room for my next team outing at work, as we often times overdo the cooking classes and picnics. One of the challenges with booking an escape room is it’s more suitable for small teams, as only one group can physically solve the room at a time. If you have a group of 50 and the room can only accommodate 10, it’s no idea for your group because you’ll have to book 5 back to back bookings. If you’ve never tried an Escape Room before, I highly recommend trying it at least one time.